At first, it may look like a Black Lagoon style shoot 'em up story, but as the story progresses, it quickly transformed into something that is much more: it combine geopolitical issue and negotiation tactics along with some very interesting character development and some philosophical discussion about weapons and arms dealers. First thing first, Jormungand is an action anime, and this story got some gooooood bullet flying, blood spilling, and even brain splattering actions. As many head shots as this anime has, I don't think this is suitable for the faint hearts. The story is on a case-by-case format, where the previous case really doesn't have much connection with the next one. But there are some small key details that do spill over. It's very much like how the original Darker than Black is formatted, which makes me think whether there's also a grand conspiracy towards the grand finale of the story (not this season obviously, but we already know for sure the second season is coming in October). The plot format too somewhat resembles what we've seen in Darker than Black: The arcs shifts between being character centric and plot centric. With a large central cast, this is probably the best way of introducing all characters without getting too dry. 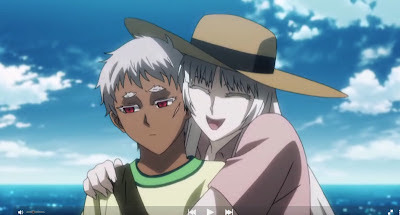 Totally agree with Jormungand being "Anime of the season". This season on my opinion had "weak endings" overall. I think of all the endings i saw the ones that pleased me the most were Jormun, Nazo no Kanojo, Fate/zero and natsuiro kiseki. What was your opinion on the overall for the season?